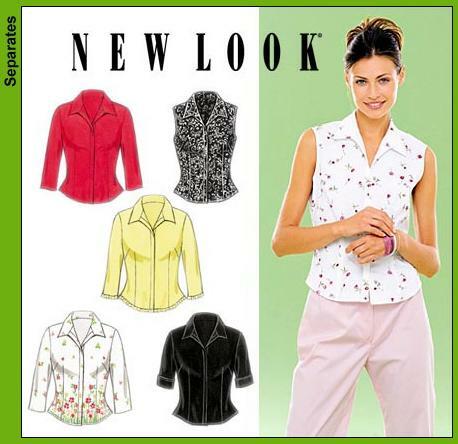 New Look 6952: Misses top with 5 different options, including ruffled hem. This top was super easy and what made it a pleasure to work up, I finally used my tracing wheel & paper to mark the darts (church bells ringing...lol). The top has front, back & horizontal bust darts providing waist shaping. Thinking back I would open a pattern before purchasing to check if there were darts and if so wouldn't buy it, feeling that it was too much work. But I'm slowly realizing darts are like diamonds - a girls best friend. I'm noticing that the fit of the garment curves to my body providing a more tailored fit. The top for the most part resembles the pic on the envelope but I opted out of the sleeve cuffs and cutting the sleeves shorter by 4", also instead of going with the hidden button placket, I did regular buttons and added a belt. Ok about the hidden button fiasco.. Here are the snaps in all their cute glory...awwww Well all be told, I initially had in mind to do snaps, tediously did the cover snaps and I guess in my excitement got ahead of myself. After marking the snap placements, I turned to my sewing machine and happily put the button foot in place (do you see where I started going wrong) and proceeded to make buttonholes only to realize after the 3rd darn buttonhole, that I wasn't suppose to do buttonholes.....uggh. Luckily, I was able to find some nondescript buttons and making it work. In the end, the blouse was perfect. What a beautiful blouse! Love the fabric! I love it! Funny story about the snaps. You sound like me getting ahead of myself. But no where near as bad! LOL! Beautiful blouse, love the fabric and your sewing is really improving! You should feel really proud of yourself!!! Lovely blouse, the color looks great on you. I'll be looking in on the sites for covering snaps. Guess what, I made french seams today! I really love that top. The colors are awesome!! Kudos, once again. Just beautiful... Fantastic job, the fabric is TDF!